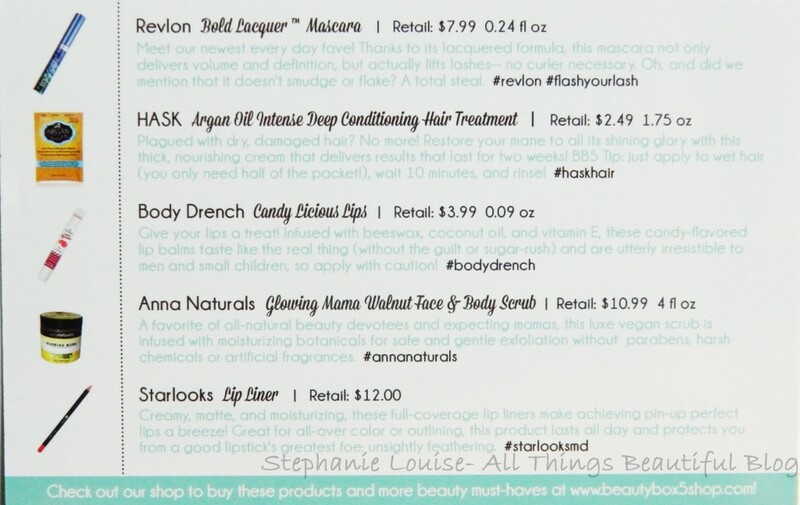 Beauty Box 5 for July 2014 featuring Revlon, Hask, & More! 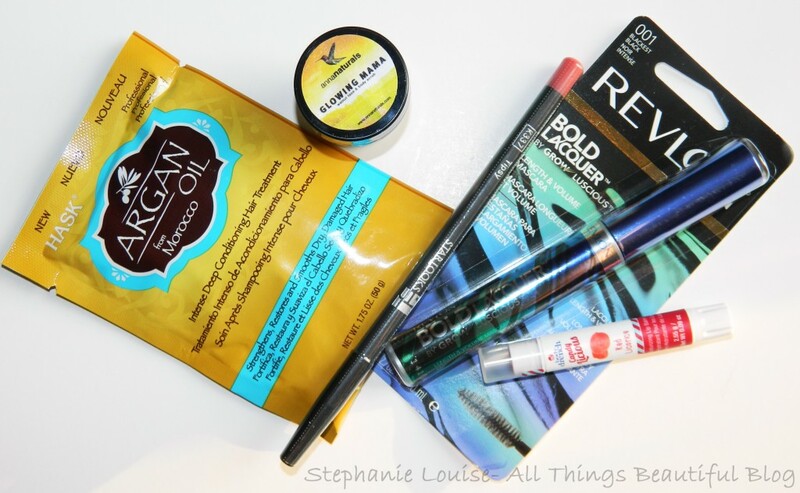 This month Beauty Box 5 brought along quite the surprise- a product from Revlon?! I’m definitely not used to seeing big drugstore brands in my boxes so this was a special treat! With a box full of great products this was one of my favorite months. 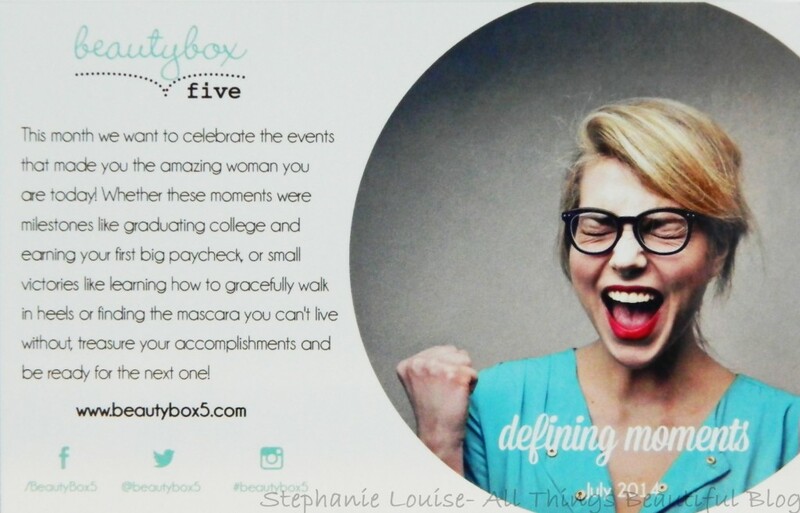 Like usual, Beauty Box 5 also hits the beauty marks in different categories as well. Here’s the card for this month- cute topic. You can click to enlarge each photo like usual to get all the details! Revlon Bold Lacquer Mascara- This is a mascara I actually haven’t tried yet! The packaging is beautiful & promises to be super dark & pigmented. It is supposed to deliver both volume & definition while actually lifting lashes to give you curl. Also isn’t supposed to smudge or flake! Hask Argan Oil Intense Deep Conditioning Hair Treatment- I actually reviewed this entire Hask line here for my thoughts! To keep it brief I really enjoyed this mask & found it nourishing. My hair tends to lean a bit dry so this is exactly what I look for. I would love if they offered this in a bottle or tub form! Body Drench Candy Licious Lips- The variety I got is Red Licorice & I really think it fits! It is also slightly tinted red & very comfortable to wear. It reminds me of eating Red Vines in a movie theater! Anna Naturals Glowing Mama Walnut Face & Body Scrub- Here’s a newbie to me! I absolutely love scrubs & this scent is lovely! It has a citrus scent & a touch of nuttiness- likely from the walnut bits. I didn’t use it on my face but it worked nicely on my hands! Starlooks Lip Liner- I’ve actually gotten this lip liner in Tipsy previously & I really like it! Here is the bag I got it in before. This is a pretty coral toned pink & although it isn’t super moisturizing I do love the color a lot! I don’t include all of the inserts I get but I thought this contest from Revlon was really a cute idea! I actually has a video shot to go with this box….but the camera focused on my dogs in the background the whole time! Shucks. Anyway- anything this month’s box reaching out to you? Have you tried this mascara yet? 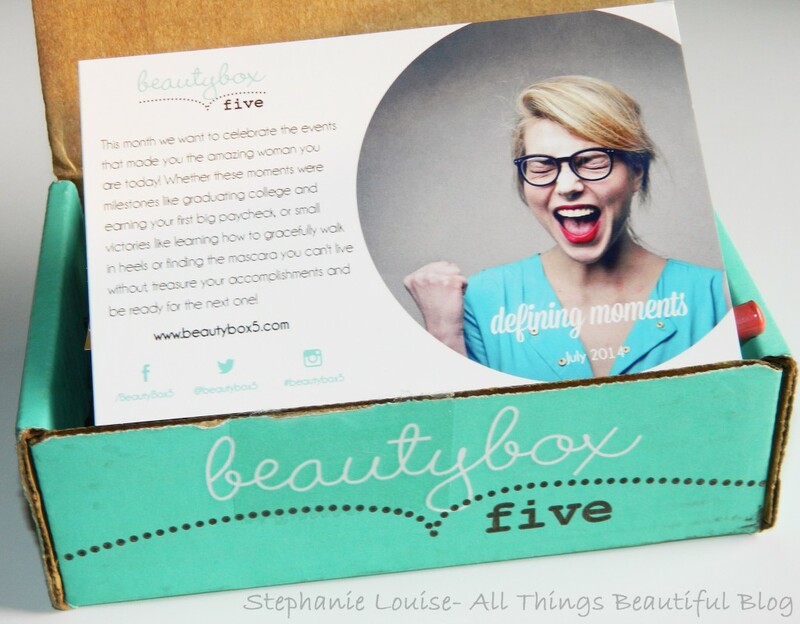 Don’t forget to sign up for Beauty Box 5 to get a box of your very own each month! Glossybox USA for July 2014 featuring GlamGlow, Skin Inc, & More! Unboxing & Review Beauty Box 5 for August 2014 featuring Nanacoco, Novex, & More! Beauty Box 5 for October 2014 featuring Chapstick, Nanacoco, & More! Beauty Box 5 Box for July 2013 featuring LA Fresh, Be A Bombshell, & More!